Photographs would not do; the films themselves would be the exhibits. The way to put silent movies on display in a museum is to project them, to make the pictures move, and that's what Broggie decided to do. Each exhibit would be identical—small screen, proscenium, and a painted audience—with a different movie playing on each screen. The final design projected six silent films at once with accompaniment from a music box. 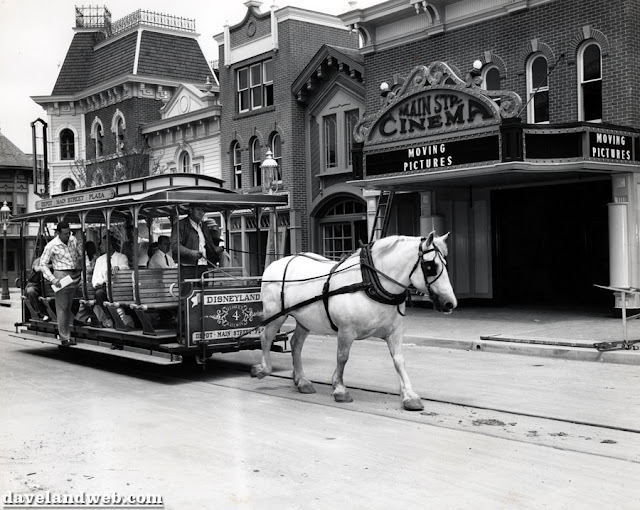 In 1955, the copyright on films from the 1910s had expired, and Disneyland easily built a library of seven-minute clips from a hundred films, including newsreels and old-fashioned, hand-tinted slides: "Ladies Over 40 Need Not Remove Their Hats." 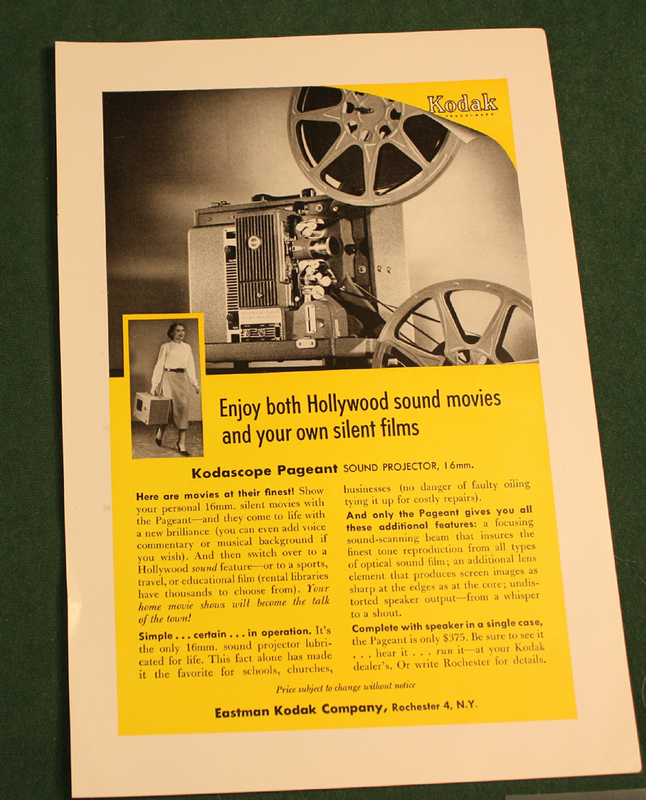 Broggie mounted his six Kodak Pageant projectors in the ceiling, an arrangement that was considered for the Circarama film. There was no need to synchronize the films. 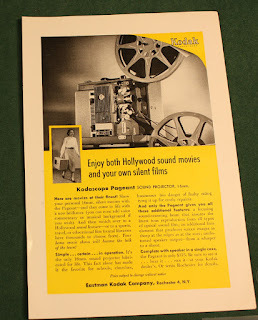 The six screens were provided by Bernard Bodde of Hollywood. As with other film presentations at Disneyland, the projectors used custom film loop cabinets, built by Broggie's Machine Shop, rather than film reels. A raised platform in the center of the room allowed a crowd to see over the heads of those closer. The films chosen included Winsor McKay's Gertie the Dinosaur, recognized as perhaps the first animated cartoon; The Noise of Bombs (1914), a Mack Sennett Keystone Kops comedy; A Dash Through The Clouds (1912); The Squaw's Love (1911), directed by D. W. Griffith; Thomas Edison's Fatima's Coochee Coochee Dance (1896); Rudolph Valentino as The Sheik (1921); The Pride of Pikeville (1927), a Ben Turpin comedy; Shifting Sands (1918) with Gloria Swanson; and Lon Chaney's Phantom of the Opera (1925). Extra credit: An odeum (also spelled odeion or odeon) was a building for musical performances in ancient Greece or Rome. The Odéon in Paris was a particularly ritzy theater. The word nickelodeon was coined (so to speak) in Boston in 1888 and was greatly popularized in Pittsburgh in 1905 to describe a place of inexpensive entertainments. The term for a small movie theater somehow transferred first to a Penny Arcade and then to a jukebox—"Put another nickel in...in the nickelodeon." (1949). As Wikipedia says, "The meaning of the word has been muddled ever since." 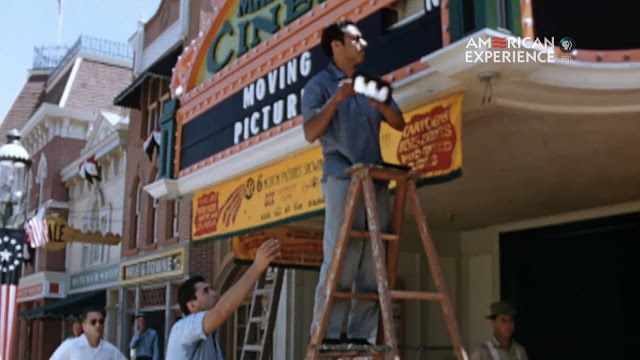 Readying the Cinema for the press preview—likely July 15 or 16, 1955.